On August 3rd, Michelle Li made Canadian badminton history in the final of the Commonwealth Games women’s singles, becoming the first Canadian woman to stand on top of the podium after a stellar win in the final against local favourite Kirsty Gilmour of Scotland. 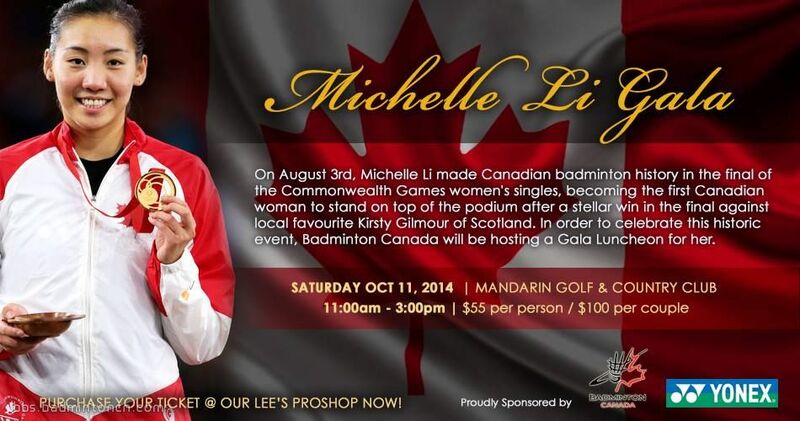 In order to celebrate this historic event, Badminton Canada will be hosting a Gala Luncheon for Michelle. The gala luncheon will take place at the Mandarin Golf and Country Club October 11th, 2014 at 11:00 am. All proceeds from this event will go towards Michelle’s preparations for the 2015 Pan Am Games in Toronto and the 2016 Olympics in Rio. Badminton Canada hope’s that you will join us in celebrating this historic event and supporting Michelle’s dream of reaching the podium in Toronto and Rio. Individual tickets are $55 per person or $100 for two. Tickets are available from Lee’s Badminton, Mandarin Badminton and E Badminton or by contacting Badminton Canada at [email protected] . GMT+8, 2019-4-26 00:48 , Processed in 0.066967 second(s), 18 queries , Memcache On.